THE JCI Puerto Princesa Peacock, Inc., or Peacock Jaycees, is set to realize its 8th Parti Sa Calle (PaSaCalle) end of this month for about a hundred indigent children it intends to support in December, during Christmas Day. Incoming Peacock president Susanne Lacson, also a lawyer by profession, is chairing the project, which is expected to have the Mutya ng Pilipinas candidates as featured guests. “This year, we are lucky that we will have the Mutya candidates as guests so we can raise funds for the indigent children we sponsor every year during the month of December,” she said. The local organization membership (LOM) has been implementing the PaSaCalle for eight years now, starting as a street party held at Jose Rizal Avenue. The project raises funds to organize its annual project Share-A-Home-Adopt-A-Child-and-Family in support to the worldwide campaign to promote the Rights of the Child. “Our children are the most important resources any country can have, it is only fitting that we support them through whatever ways we can,” Lacson said. The patrons of PaSaCalle include San Miguel Beer, Shell Philippines Exploration B.V., Centro de Benito y Aliva, Rio Tuba Nickel Mining Corporation and Coral Bay Nickel Corporation, and Pilipinas Shell Foundation, Inc.
Last year’s profit from the PaSaCalle provided support to nearly a hundred children and family beneficiaries from indigent barangays north of the city. AROUND 1,700 residents of Barangay Poblacion 2 and 4 of the municipality of Roxas was served by the Balikatan sa Kalusugan medical, dental and healthcare mission initiated by the JCI Palawan Region and the JCI Puerto Princesa Peacock, Inc. local organization membership (LOM) in partnership with the offices of Palawan board members Derrick Pablico, Leoncio Ola and Gil Acosta on October 18. On the morning of the said date, more than 20 members of the LOM trooped in a convoy to the municipality, a silica mining town south of Palawan, to implement Balikatan sa Kalusugan, a project that was aimed at helping provide the basic medical, dental and healthcare needs of many residents of Roxas. For a whole day, the members of the LOM and the staff of the three board members provided for free medical check-ups with medicine, free tooth extraction, blood typing, circumcision, blood sugar and cholesterol testing, blood smearing for malaria parasite (BSMP), blood pressure check-ups, and free long lasting bed net distribution courtesy of Pilipinas Shell Foundation, Inc.’ anti-malaria campaign. In their messages, the three board members reminded the residents of the two barangays to mind their health and that of their families. “Health is important to all of us. These are the times when we should not neglect it,” Ola said. “Our children’s health should also be minded. The saying that health is wealth is true. If our children are sick and we do not pay attention to them, they could lose their lives,” Pablico also said. For his part, Acosta reminded barangay officials that they have the task to help care for the health of their residents by making sure that utmost concern is given so they can be self-reliant. The board members said they initiated the medical, dental and healthcare mission in Roxas due to request from local barangay officials. In partnership with the JCI, the request was provided because the young professional leaders and entrepreneurs group cares for the welfare of the people through its social responsibility projects and programs. Poblacion 4 barangay chairman Gilbert Ryan Corral, on the other hand, expressed his gratitude to the JCI Palawan Region, JCI Puerto Princesa Peacock, Inc., Acosta, Ola and Pablico for bringing Balikatan sa Kalusugan to his people. “We are very thankful that our request for a medical mission happened here in our barangay. You have helped so many people and for that, they will always be thankful. We hope that this can be done again,” Corral said. Balikatan sa Kalusugan was supported by the Western Command through Rear Adm. Ruperto Rico C. Borromeo, Philippine Charity Sweepstakes Office, the municipality of Roxas through Mayor Dennis Sabando and his wife Angie, 1st Palawan District Rep. Antonio C. Alvarez, Marine Battalion Landing Team 9 under Lt. Col. William D. Bimeda and many more. AROUND A hundred children benefitted from the “Healthy Food, Healthy Kid Feeding Program” that was jointly launched on July 26 at Matatag community in Panacan Dos village, Narra by the officers and members of the JCI Narra Katala, JCI Puerto Princesa Peacock, Inc. and the JCI Palawan Region. 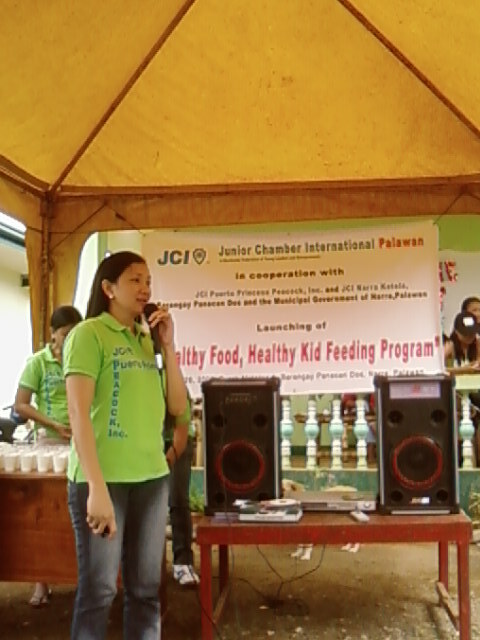 The feeding program was launched in the municipality as a project for the JCI Narra Katala, whose president is JCI Mem. Leonora Guanco-Maala, and as a support to Mayor Clarito D. Demaala’s goal to solve the problem of undernourished children in Panacan Dos. Speaking in front of barangay officials of Panacan Dos, parents and children, JCI Mem. Gemma B. Medina, LOM president of the JCI Puerto Princesa Peacock, Inc., encouraged parents in the area to take care of the health of their children by feeding them with food that is high in nutritional value so they grow healthy. “We are launching this project because we want Narra to have happy and healthy children. Children who are not fed with food that is high in nutritional value are susceptible to different kinds of illnesses. We have to strengthen their immune system and that will only happen if you help take care of their health,” she said. The undernourished children of Panacan Dos were fed with newly cooked soup made of vegetables, pasta shells and milk donated by sponsors. 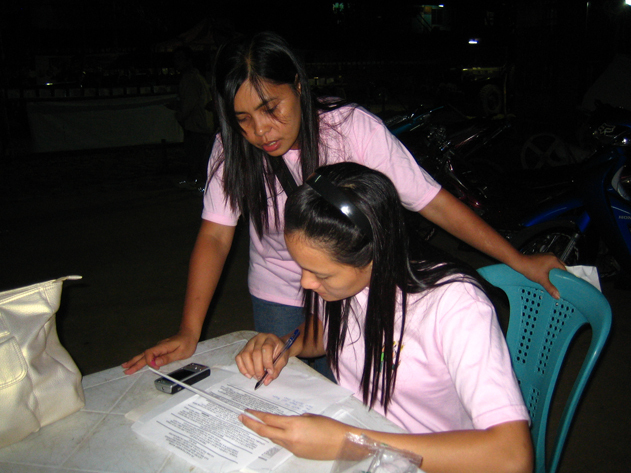 The Panacan BEANS, barangay health workers, barangay officials and others help in preparing them for the children. “We would like to thank the parents of the children who are here right now because they show that they really, really care for the welfare of their children. We must not neglect their health because that’s one way for them to be happy in the community,” Maala said. According to barangay chairman Josefina Danao, Panacan Dos is one of the barangays in Narra where the number of undernourished children is high. “We are thankful that there are organizations like you from Puerto Princesa who are willing to come this far to help our undernourished children,” she said. She stated that the leadership of the members of the Jaycees in Palawan should be emulated by other young professionals because it is a “good feeling” to help people who are in need. 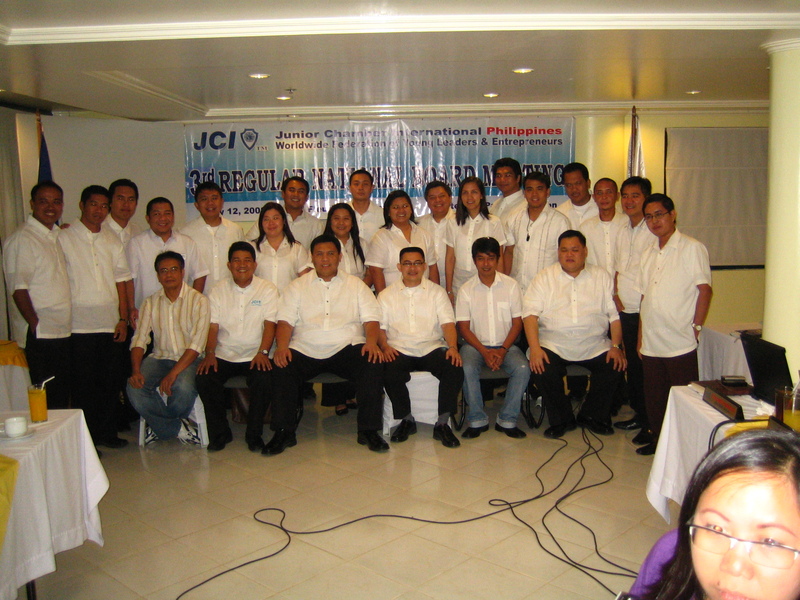 “Health is wealth,” said JCI Mem. Celeste Anna R. Formoso, the JCI national vice president for Palawan Region. She explained that healthy children have more opportunities than those who are not because they have chances against getting sick. She likewise encouraged the parents who attended the launching to open their eyes on the need for their children to be healthy and active as they grow up to face the challenges of the future. THE JUNIOR Chamber International Philippines (Philippine Jaycees, Inc.) launched on July 12, 2008 this year’s search for the Ten Outstanding Young Men (TOYM) of the Philippines led by its national president JCI Sen. Raphael A. Lesaca, the members of the 2008 JCI Philppines National Board and JCI Mem. Ramfel R. Preclaro, its commissioner. Preclaro said the TOYM is being launched again to honor young Filipinos who will distinguish themselves for their exemplary contribution to the advancement of the global community through their leadership skills, social responsibility and fellowship necessary for positive change. He said the objective of the search is “to recognize the outstanding achievements of our nation’s youth which have benefited the community and the nation significantly; focus public attention and confer national recognition to these young men and women based on their outstanding achievements and contributions; inspire others, especially the Filipino youth, with the recognition of these achievements and/or leadership of the TOYM awardees who have demonstrated vigor and enterprise in tackling the problems of society and offering solutions; and to live the Jaycee Creed and consider it a good measure of performance by the awardee. For inquiries regarding how to nominate, Preclaro said individuals or groups can visit www.philjaycees.com for information. Last year’s awardees were Kara Patria David for broadcast journalism; San Juan City Mayor Joseph Victor Ejercito, government/public service; Capt. Giemel Espino, military service; National Disaster Coordinating Council (NDCC) Deputy Administrator Dr. Anthony Rolando Golez Jr., disaster management; Dennis Mendiola, business leadership; Navotas City Mayor Tobias Reynald Tiangco, community service; and Rev. Fr. Fernando Suarez, for religious service. The TOYM Awards was initiated by the Manila Jaycees on April 6, 1959. Since then, the TOYM Awards has become an institution with a reputation for selectiveness in its choosing the outstanding young men and women for the award. A supporter of PaSaCalle who bought her ticket at the entrance of Centro get a free TM sim card from JCI Mem. Jo Almira while 2008 incoming president JCI Mem. Gemma B. Medina look on. THE JCI Puerto Princesa Peacock, Inc.’ Siete PaSaCalle sa Centro, a fundraising project for its December project Share-A-Home-Adopt-A-Child-and-Family, was successfully held at the Centro de Benito y Aliva on the night of November 30. Globe, San Miguel Beer, Coca Cola, iFM 99.9 and Centro de Benito y Aliva were the partners of the local organization movement (LOM) in implementing the seventh year of PaSaCalle or parti sa calle which shall benefit more than 70 children and their families this December when Share-A-Home is implemented. JCI Mem. Siony and incoming Pres. Gemma get busy during Siete PaSaCalle sa Centro on the last day of November. More than 500 friends, patrons, donors and supporters of the LOM attended the fundraising event despite slight rain showers, a 20 minute blackout and the holding a simultaneous event at nearby provincial capitol building. “We are so thankful that despite rain showers and the blackout, people still waited to see what we have in store for them during Siete PaSaCalle. For seven years, they have been supporting this project, and once again, we would be able to implement Share-A-Home come December 24,” JCI Mem. Siony Pilapil, chairperson of Siete PaSaCalle, said during the opening. Project chairperson JCI Mem. Siony explains what is PaSaCalle to the people who attended the fundraising event at the Centro de Benito y Aliva building compound. 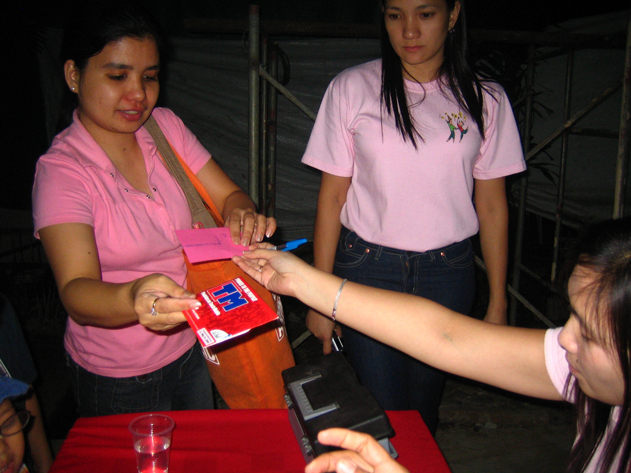 Globe sponsored cash and gave away free sim cards for those who bought tickets at PhP100.00 each. San Miguel Beer sponsored light beverages; Coca Cola sponsored 25 cases of soft drinks; while iFM 99.9 was the official FM station of Siete PaSaCalle during its promotional campaign. The venue of Siete PaSaCalle, on the other hand, was offered free courtesy of Clink Hagedorn and Girlie Bayron, two of the owners of the building compound. Other major sponsors were PLDT; Mountain Bay’s Touch, a new medi-spa place in Puerto Princesa; Norkis Yamaha; TGT Vulcanizing and Tire Center, newspapers Repetek and Palawan Times; EMRB Stitch and Frame, BMP Trading, La Niña Loading Station, and Swiss Solar, Inc..
JCI Mem. 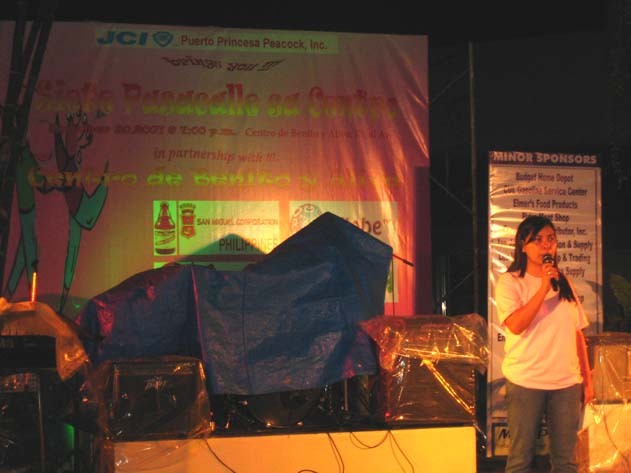 Gemma B. Medina, incoming president of the Peacock Jaycees, said the “pure and noble intention behind PaSaCalle has made it a consistent part of events in Puerto Princesa that never fail to attract the support of the people” and that for this, she is thankful. “The Peacock Jaycees has nothing in heart but the desire to help indigent children and their families this Christmas. With the help of our partners and sponsors, we would be able to help many children again,” she said. IN the first ever Regional Council Meeting of the JCI Palawan Region, it was agreed that the planning meeting for the holding of the 61st JCI Philippines National Convention in Puerto Princesa will be done on the second week of January next year. According to JCI Mem. Gemma B. Medina, president of the JCI Puerto Princesa Peacock, Inc., January is the best time to begin discussing plans for the national convention, beginning on the setting up of several committees to handle its implementation. 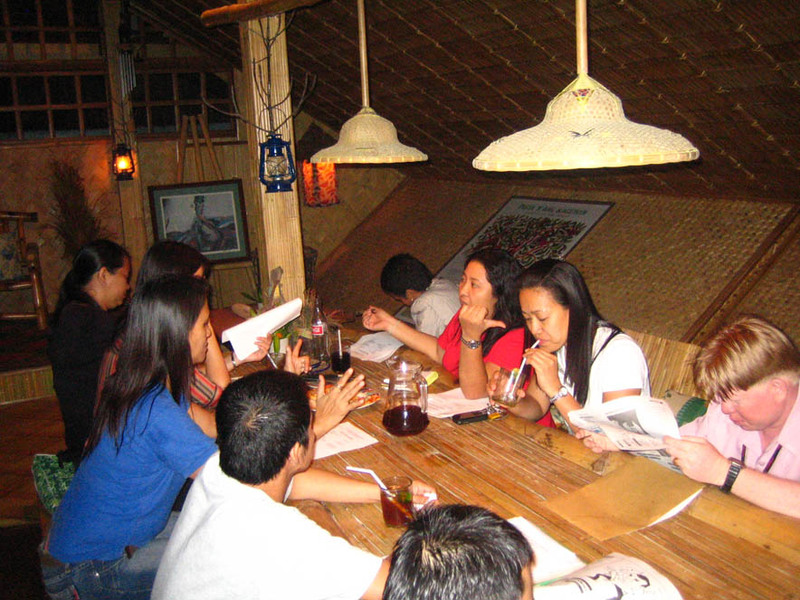 First RCM of the Palawan Region held at Neva’s Place on November 22. The RCM, which was attended by the presidents of the three LOMs, the other two JCI Puerto Princesa Oil outgoing president George Vasquez, and JCI Puerto Princesa Kiao Pres. Bennette Tamayo, discussed the national convention following information that the PhP100,000.00 “performance bond” has already been deposited to the account of the NOM. The JCI Puerto Princesa Peacock, Inc. is only six days away from its big event, Siete PaSaCalle sa Centro, which will be on November 30, 2007 at 7:00 p.m. at the back of the Centro de Benito y Aliva here in Puerto Princesa City. JCI Mem. 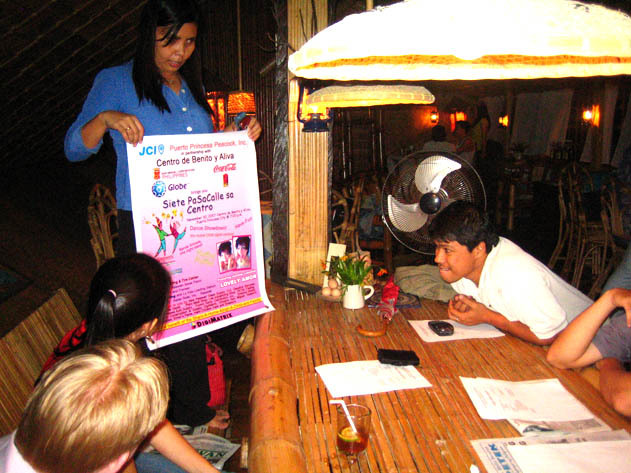 Siony N. Pilapil, chairperson of Siete PaSaCalle sa Centro, shows a promo poster of the fund raising project to officers of the Palawan Region during its first meeting at Neva’s Place on November 22. Looking on were incoming Peacock Jaycees president, JCI Mem. Gemma, Regional Deputy NVP Ian Barroma and Pres. George Vasquez of Oil Jaycees. The fund raising project will be implemented by the Peacock Jaycees with partners San Miguel Beer, Globe Telecommunications, Coca Cola Bottler’s Corporation and iFM 99.9, said JCI Mem. Siony, the chairperson of Siete PaSaCalle sa Centro. The project, now running 7 years, is an annual effort of the LOM to raise funds for the Share-A-Home-Adopt-A-Child-and-Family implemented in Puerto Princesa during the Holiday Season. Basically, it adopts about 50-60 indigent children with the help of the City Social Welfare and Development Office (CSWDO). “We are already excited to do this street party because of the tremendous support of our partners. The LOM is blessed to have them all supporting us almost each year, such as San Miguel Beer,” JCI Mem. Siony said. Siete PaSaCalle shall feature rising Palawan stand up comedian Lovely Amor from Manila, the Free Play band, a raffle draw where a digital camera worth P10,000.00 can be won, a dance showdown for five groups of teenagers between 15-18 years old, and lots of other surprises. Tickets for Siete PaSaCalle cost P100.00 each. PUERTO Princesa Mayor Edward S. Hagedorn expressed positive support to the Junior Chamber International Philippines 61st National Convention that will be held in October 2009 in the City to be implemented by the JCI Puerto Princesa Peacock, Inc. in cooperation and partnership with the JCI Puerto Princesa Oil and the JCI Puerto Princesa Kiao. In a meeting last week at Badjao Seafront, Mayor Hagedorn said he is proud that there are organizations of young professionals in the City that are willing to contribute to its good image by doing respectable leadership and entrepreneurship. Informed of the numerous awards that the JCI Puerto Princesa Peacock, Inc. has received from the recently held 27th Southern Luzon Area Conference in Legazpi City, Bicol and the 59th JCI Philippines National Convention in Cebu, Mayor Hagedorn said he can’t find it in his heart not to support the LOM when all it did is bring glory and achievements to the City. “By 2009, many things have changed in Puerto Princesa. We would have more hotels and more restaurants to cater to the need of the delegates who will join the national convention. You can rely on the City Government’s full support on this project, and we promise to bring the Jaycees an event they will never forget,” Mayor Hagedorn said. 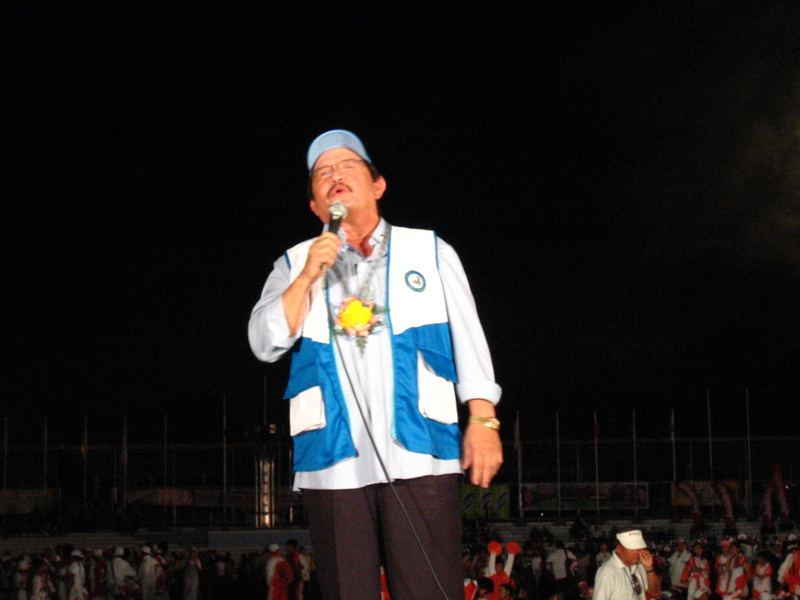 Initially, he has offered the free use of the nearly 10,000 sitting capacity Puerto Princesa City Coliseum for all the events of the forthcoming national convention. The place is located in Barangay San Pedro, and has been the venue of large concerts, graduation ceremonies, convention and other events. Mayor Hagedorn said the City Government will be honored to welcome the Jaycees in Puerto Princesa to personally demonstrate to them what it is all about and why it is slowly becoming a model in sustainable development compared to other highly urbanized cities in the country.